CID 797718 is a potential PKD binding agent. Potent inhibitor of protein kinase D (PKD); inhibits all PKD isoforms (IC50 values are 1, 2 and 2.5 nM for PKD1, PKD3 and PKD2 respectively). Exhibits selectivity for PKD against a panel of >90 protein kinases, including PKCα, MEK, ERK, c-Raf and c-Src. Reduces proliferation and cell viability of pancreatic cancer cells expressing moderate levels of endogenous PKD1/2. Orally bioavailable. CID-2011756 is a cell-active ATP competitive and specific PKD1 inhibitor that inhibits phorbol ester-induced endogenous PKD1 activation in LNCaP prostate cancer cells. 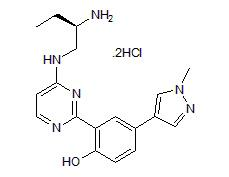 CID 755673 is a selective and potent protein kinase D1-D3, PKC, CAK, PLK1 and CAMKIIα inhibitor. kb NB 142-70 is a selective protein kinase D (PKD) inhibitor (IC50 values are 28.3, 58.7 and 53.2 nM for PKD1, 2 and 3 respectively).